Mini Review Round-Up: (Tegan and Sara, The Wonder Years, Jay-Z, and Yeah Yeah Yeahs) | Ranting About Music! Doing a little bit of catch up today on some miscellaneous albums I’ve meant to review for the last few months. I only somewhat follow Tegan and Sara, so I can imagine how the diehards took it when they heard supercharged lead single “Closer” for the first time. With Heartthrob, Tegan and Sara jump head first into an electropop sound that puts the emphasis firmly on the “pop” side of things. 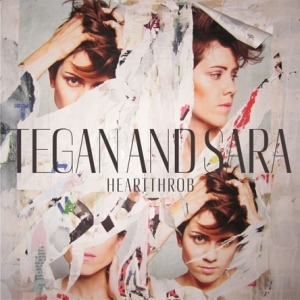 But the choice to go for broke on pop gave Tegan and Sara direction, and they used that focus to make an album loaded with killer pop songs. Heartthrob finds success in seeing that going mainstream doesn’t mean dumbing anything down. Underneath the “ten pop songs about love” premise, Heartthrob is a whip smart record from its crisp and powerful production to its ridiculously catchy hooks to its deft lyrics. This dedication makes the record a little singular, but it’s a small price for quality like this. There are euphoric rushes like “Closer” and “Drove Me Wild”, and ballads like “I Was a Fool” and the endearing “Love They Say” with few discernable slow spots. Heartthrob finds ways to connect with romances good, bad, and universal, all while being an absolute thrill to listen to. 4/5. 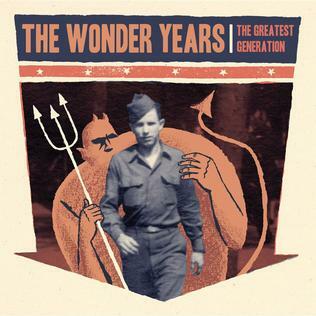 2 years after breakthough Suburbia, I’ve Given You All And Now I’m Nothing, pop-punk juggernaut The Wonder Years come out swinging harder and better on The Greatest Generation. Part of what makes The Wonder Years such a success with their audience has been their ability to mature with their fans; Suburbia hit on exploring your environment and figuring out where you fit, while TGG feels a little more figured out, but desperately searching for that stability that implies you made the right choices (“We Could Die Like This” takes the refrain of “Operator, take me home/I don’t know where else to go/I wanna die in the suburbs”; suddenly that monotony and safety sounds inviting). The personal stakes in The Wonder Years’ songwriting is only sharpened by Soupy Campbell’s passionate delivery and the band’s go-for-broke instrumentation that’s surprisingly refined for how much raw energy it has (just check out how much is going on behind the monster hook in “Teenage Parents”). The lyrics are also anthemic, introspective, and powerful even if they’re just being read; this is the kind of music you hear, and instantly connect to. Every 20something laments that they don’t know what they’re doing with their life, and while The Greatest Generation doesn’t provide immediate it answers, it inspires the listener to go find them. 4.5/5. Magna Carta…Holy Grail might as well be a double album with Yeezus based on how often the two are compared to each other. Legendary hip-hop producer Rick Rubin made the comparison explicit, saying that whereas Yeezus was “challenging and progressive”, Magna Carta…Holy Grail is “a more traditional hip-hop record”. Numerous publications have played this up as a burn, but it’s more common sense than anything else. As of MCHG, Jay-Z’s an institution, and MCHG is this year’s product: polished, sleek, and made with the most expensive parts on the market. There are fewer crossover attempts here than The Blueprint 3; this album plays fairly close to genre, where Jay-Z explores a few more personal topics in addition to his normal (but still entertaining) boasts. Magna Carta…Holy Grail is nowhere near Jay-Z’s best work, but the level of quality to it is great for replays. It’s an entertaining album that’s consistently good and intermittently great, but rarely mediocre. Most tracks will be entertaining from a production standpoint or Jay will go above and beyond in writing, and sometimes you get both. Coming up “neither” also happens, as the album loses itself a bit past the excellent “Part II”, and the album feels a bit safe altogether, but Magna Cart…Holy Grail is an enjoyable listen by an artist whose expected sell-by date is nearly a decade old itself. 3/5. Everyone, including the band itself, is amazed Yeah Yeah Yeahs are still around some ten years after Fever to Tell. But, as the rest of the garage-rock buzz bands have imploded, here they are, and a damn sight better than The Strokes. But, like The Strokes, Yeah Yeah Yeahs are staring their age in the face: they weren’t supposed to make it this far. They’d even successfully reinvented their sound. Twice. Mosquito, then, is the band’s “anything goes” album, focusing on low-fi aesthetics and songs born of spontaneity. For a band that hit “a low” during pre-recording, it’s a common strategy, albeit one with scattershot results. The band’s willfulness to follow their impulses results in delightful surprises like the gospel choir on lead single and all around great YYYs tune “Sacrilege”, or the murky tension of “Subway” (which samples an honest to God subway car for a beat), but the album doesn’t take full advantage of its ideas. Rather, it presents the idea, fiddles with it for awhile, and never develops beyond a particular groove, and so the potential to songs like “Under the Earth” and “These Paths” gets squandered. The end result is an album with some career highlights, but little incentive to listen to as a whole. 3/5. This entry was posted in Album Reviews, Lists and tagged album, Heartthrob, Jay-Z, Magna Carta Holy Grail, Mosquito, music, review, Tegan and Sara, The Greatest Generation, The Wonder Years, yeah yeah yeahs. Bookmark the permalink.